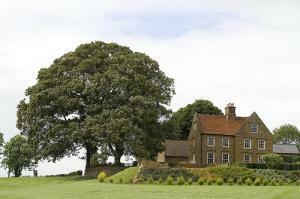 Choose from 60 hotels and guest houses in Northamptonshire. Shown below a just a selection of the hotels available. To search within an area please use the menu on the right. The wide, tree-lined market place in Brackley, with its Georgian and Victorian houses and shops, is the delightful setting for this 13th century coaching inn. Enjoy idyllic leisurely walks along bridleways and footpaths with two major walkways: the Knightley and Grafton Ways (both well signposted). Nearby you can also find Stowe Gardens and Park, the largest landscape garden in Britain, which boasts a magnificent Georgian garden full of romantic temples and lakes. The ideal base for exploring Banbury, Buckingham, Oxford and Northampton, the Crown's comfortable surroundings offer a cosy retreat coupled with good old-fashioned hospitality after a long day's travelling. 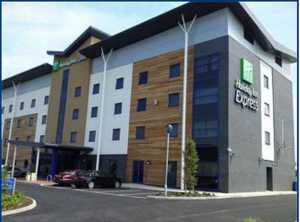 Hampton by Hilton Corby is a contemporary hotel near Kettering, conveniently located on Rockingham Leisure Park development, with good access to the A14. 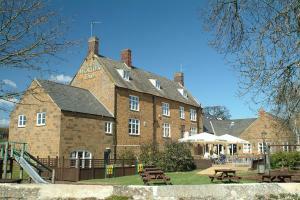 The hotel is perfectly placed to explore the woodlands, country parks, and stately homes of Northamptonshire. The historic Rockingham Castle is near to the hotel, along with Rockingham Speedway and Kirby Hall. The Hampton boasts a fitness centre with cardio and weight equipment. 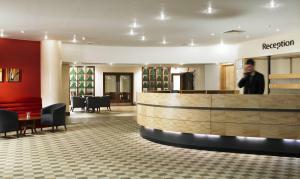 For business and conference use, the hotel offers 4 spacious meeting rooms. Rooms are stylishly furnished and are benefitted by an en suite with walk-in power shower. Free internet access is available in the rooms, along with a flat-screen LCD TV. Relax over a drink at the stylish hotel bar, which also serves a selection of snacks. A complimentary breakfast is available for guests. In over 12 acres of attractive, peaceful grounds, this beautifully restored 400-year-old building commands stunning uninterrupted views over open countryside. Overlooking the canals and the marina, Braunston Manor is located in the village of Braunston, on the border of Northamptonshire and Warwickshire. With flowering shrubs and daffodils in spring, the grounds roll down to the Grand Union Canal. The Manor has been in the same family for almost a century. However, the Northamptonshire-stone building dates back to the Tudor period. Today, the building has been attractively restored and now offers 10 individually decorated rooms, each with its own unique charm and character. Every spacious and luxurious room has been sympathetically furnished in keeping with the period of the building. Many of the rooms have four-poster beds, beautiful original features, period fireplaces or antique furniture. Some rooms overlook the canal and the marina, while others look out onto the lawns and gardens. Free Wi-Fi wireless internet access is available throughout the building. The manor is located on the village's high street, opposite a beautiful old church and less than 5 minutes' walk from Braunston's lovely traditional old pub. Free on-site parking is available. Situated by Drayton Water, in picturesque Northamptonshire, this spacious modern hotel is set in its own grounds. 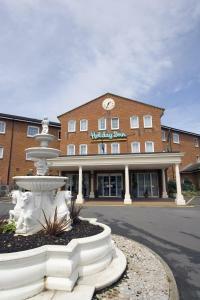 The hotel provides a convenient Midlands location with a wealth of interesting places to visit on the doorstep. Spacious and comfortable bedrooms include a selection of study rooms, with a practical work area, and premium rooms. All rooms have private bathroom, direct dial phone, satellite tv, radio, trouser press, hairdryer and hospitality tray. Many come with views overlooking the central courtyard or surrounding countryside. The Leisure Club offers a friendly, relaxed atmosphere, a place to improve your health and fitness or somewhere to relax and unwind with family and friends. The Olde Coach House is home to 6 brand new, en suite bedrooms, relaxing bar areas and a contemporary restaurant. Set in the village of Ashby St.Ledger, the guest house is located on the A361 just off junction 18 of the M1. Experience comfortable and modern rooms alongside good food, good beer and wine and friendly service. Please book a table for the restaurant in advance, to avoid disappointment. In the idyllic rural hamlet of Castle Ashby, just a few miles from Northampton, this traditional country inn now offers free wireless internet, good service, tasty food and great value. With parts of the building dating back to the 16th century, the Falcon has 16 en suite rooms, 6 in the main hotel and the remainder in the adjacent cottages. All of the rooms are beautifully decorated with country fabrics and subtle colours. The award-winning Compton's Restaurant overlooks the hotel's delightful mature gardens and offers a range of menus and dishes, with something to suit everyone. The delicious food is made with high quality ingredients, with local produce used whenever possible. The extensive wine list includes a selection of wines from around the world to complement your meal. 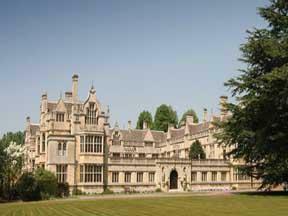 The Falcon is just a few minutes from Castle Ashby House and its magnificent grounds. Dating back over 400 years, the Saracens Head featured in the Charles Dickens novel, 'The Pickwick Papers'. It now mixes history, homely comforts and modern luxury. A centrepiece in Towcester, the Saracens Head serves food all day in the lounge and bar areas, from traditional steak or fish and chips, to more modern choices. The split-level lounge bar has welcomed locals and guests to Towcester for hundreds of years, with 3 distinct areas in which to relax and enjoy delicious snacks. On a Roman street, the Saracen's Head is ideally placed for Towcester Racecourse. The Silverstone race track is just 3 miles (4.8 km) away. Also nearby is Stoke Bruerne, a canal-side village with cottages and narrow boats. This Premier Inn is just off the M1, at Watford Gap Motorway Services, and close to Junction 17 for the M45. A Roadchef restaurant and Costa coffee outlet are on site. Premier Inn Daventry (Watford Gap) has free parking, meeting facilities, and is convenient for Daventry, Rugby, Coventry and Northampton. Some rooms at Premier Inn can take 2 adults and up to 2 children (under 16 years). One child gets a free full breakfast when accompanied by an adult eating a full breakfast. The full breakfast has the expected cooked items, including vegetarian sausages, as well as a wide continental selection. 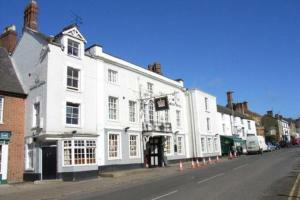 The Globe Hotel is a 19th century coaching inn with 18 en-suite bedrooms, a public bar and a restaurant. The hotel is privately owned and operated and its location and informality are two excellent reasons to choose us. 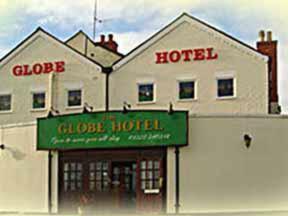 The Globe Hotel is set in the heart of the Shires, 8 miles from the centre of Northampton and 3 miles from the centre of Daventry. Our central, easy-to-find location at the A45-A5 junction is a distinct advantage to both tourists and business people alike. The hotel is independently owned and operated in a personal family manner. 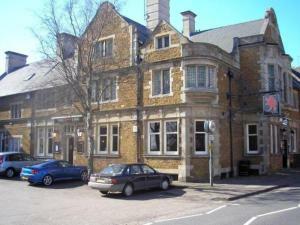 This coupled with our modest charges and extremely friendly service make the Globe Hotel an absolute must when staying in the Northampton area. Please be aware that the hotel has no lift. The Raven Hotel offers home-cooked food, free Wi-Fi, free parking and comfortable rooms at great-value rates. The hotel offers a range of accommodation to suit the needs and budget of any traveller. Some rooms have en suite bathrooms and rooms without en suite bathrooms are also available. All of the 18 rooms are spacious with large windows. Each room has a TV and tea/coffee making facilities. Food is available every day and is home-cooked, using fresh ingredients wherever possible. The hotel's Piano Bar offers live entertainment and has a heated and covered outdoor smoking area with its own plasma TV and sound system. The bar has Sky Sports and sporting events are shown on the plasma screens. The bar also hosts quiz nights, curry nights, steak nights and live piano nights. The bar offers a range of alcoholic and non-alcoholic drinks, including a selection of real ales.